On Thursday afternoon, one lucky section of 5th Grade English joined the students of Brent Catlett and Sharae Geldes in Bellevue, Nebraska and Linda Yollis in Los Angeles, California for a Google+ Hangout. The 'Share & Compare' Hangout was the brainchild of Brent and Linda, and we were thrilled to participate from our New York City classroom. My students prepared for the 3-way video chat by researching general facts about our state, city and school. They collected facts about everything from favorite cafeteria foods and recess games to weather and population statistics. They learned a lot about their home state and city through their fact-finding mission, and clearly felt a sense of importance as they took each took a turn in front of the laptop to present their information. A major highlight of the experience was seeing where we veered off our planned path in order to go deeper into those topics the students found compelling. For example, the suburban children of Nebraska and California were shocked by the huge population of New York City, which led to a nice chat about apartments and, for lack of a better phrase, 'vertical living.' Similarly, my city kids were very intrigued by the unfamiliar tornado and earthquake drills the other schools participated in, and eagerly listened as the other students described their emergency precautions. As our students took turns sharing facts, designated 'record-keepers' worked on updating a Google Doc that the three classes shared. The final result was a side-by-side comparison chart of New York City, Bellevue, and Southern California. The information contained within the chart is evidence of the differences and similarities between our three communities. This Hangout was an awesome learning experience in all the right ways: fun, thought-provoking and student led! What a fabulous experience! Everyone got so much out of it! We talked a lot about all the differences, especially NYC housing and Nebraska tornados! We'd love to do a follow up. Maybe have it be more of a processing of information and then an open forum of Q and A. We had such a great experience too! Thank you guys so much! What an awesome experience for all the kids involved! I know ours were left wanting more! We are game for a follow up too! What a spectacular way for kids to see how things are in different parts of our country. Not everyone is fortunate enough to get the luxury of travel and to see how "vertical" living really looks is amazing. What an awesome tool and kudos to you for coming up with this idea!!! Thanks, Michael! Although I can't take full credit - it was the brainchild of Mrs. Yollis, and it would not have been the same without her and Brent! I love this idea! I am very interested in a share and compare with classrooms across the United States and possibly the world. This ties directly into our curriculum and is a way to bring the real world into the classroom. What an amazing opportunity for you as well as your students! Thanks for sharing! I am intrigued by the use of google hangouts to provide an authentic audience for the learning that is happening in the classroom. As a high school teacher, motivation is a major obstacle that I have to overcome. Google Hangouts would provide an effective method of creating relevance for the students. Great idea!!!! Wow! That was a fantastic way to make learning real, memorable, practical and fun. I can't imagine any of your students was ever less than 100% engaged and excited about this learning experience! What a great experience for all three classrooms! I love that everyone got a chance to spend some time in front of the big screen reporting their facts. Using the Google Doc to record your facts was genius. 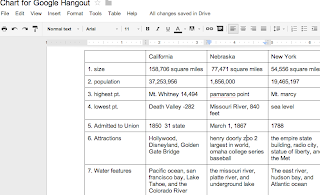 I have been trying to think of how to use hangouts in the library, and this gave me some great ideas. My 6th graders write and produce puppets shows that they could share with younger students. I know they will love this idea. Kudos to Brent, Sharae, Linda and Jenny! What an awesome learning opportunity to bring students from all parts of our great nation together! I came from the age of textbook learning and materials in black / white print. Now students can meet face-to-face in a technology enhanced environment that makes the world around more real than ever! Awesome! What a great learning experience for your students. It's nice to give them a change of pace in the classroom. I'm sure they were excited to use GoogleHangouts with someone from California. It allows them to experience things and people from different parts of the country without ever leaving the classroom. Thanks for sharing. Nice work done by all! This is an outstanding learning experience for you students. Not only did it allow them to learn more about their state, but they were able to learn more about the other state. A great way to learn about the nation in a creative and fun way! Thanks for sharing with us all. What a wonderful idea! Its so exciting to see how the kids are so eager to take charge. Technology is a way of the future and its also a way to help build excitement with integrating technology. Finally, many students will never have the opportunity to travel to California, but can see the state through a new lens without having to travel. What a wonderful idea! Many students will never have the opportunity to travel to California, but are able to view this experience in a new light. 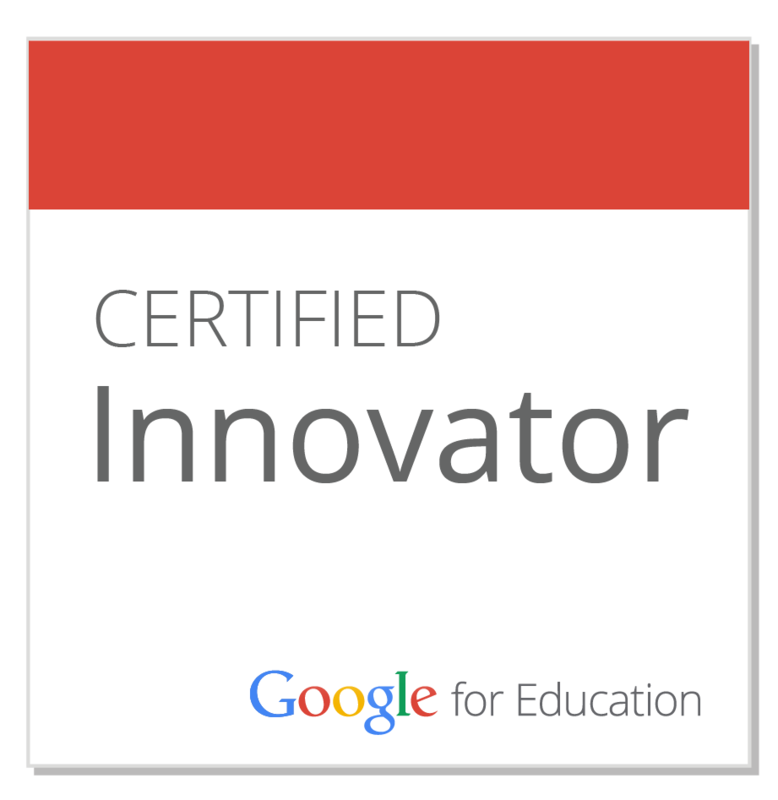 I'm really looking forward to using Google Hangouts in many similar ways as you in my classroom. Thank you for your ideas! Connecting with other classrooms is such a benefit to Google! When I think about my time as a student, it is so different from today. The walls are down! Thanks for sharing your experience. Very interesting way for students to learn from each other. I especially liked the contrast and compare spreadsheet. Very Neat! 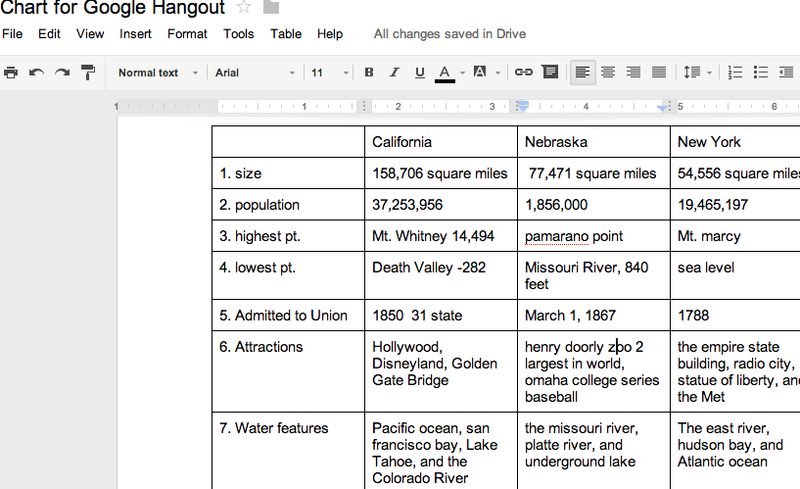 I really like the compare and contrast the students were doing on the spreadsheet. Great Job! What a great idea! I love this. I bet the students loved learning more about their own state as well as the other state. It gave kids a reason to find their facts and gave them a bigger purpose. I love this idea. Thanks!